The Digium ATDM800 Series of PCI Cards has been discontinued by the manufacturer and is no longer available. The direct replacement is the Digium A8 Series. For more information or if you have questions, please call 800.398.8647. Digium TDM805E 8-Port Modular Analog PCI 3.3/5.0V Card with 5 Trunk Interfaces and Echo Cancellation. 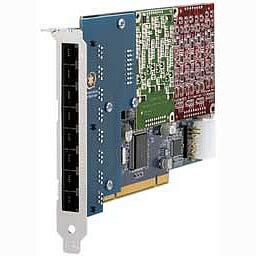 The Digium Wildcard TDM800P is a half-length PCI 2.2-compliant, 8 port card for connecting analog telephones and analog POTS lines through a PC. It supports combinations of FXS and/or FXO modules for a total of 8 lines. The Digium TDM800P is an industry first with 8 standard two-wire, RJ-11 interfaces on a single PCI bracket. The TDM800P eliminates the need for multiple brackets, external dongles, and splitters. The TDM800P reduces setup part complexity, cable clutter, and limits points of failure. The TDM800P contains two module banks. Each bank supports up to four analog interfaces. The module banks can be filled either with one standard quad analog module (FXS - S400M, FXO - X400M), or up to two standard single analog modules (FXS- S110M, FXO - X100M) enabling the creation of any combination of ports. Additionally, the TDM800P may be used in conjunction with Digium's High Performance Echo Canceler (HPEC), a commercial and toll quality hybrid echo cancellation solution. Digium's HPEC provides 16ms to 128ms of selectable near-end ITU G.168 compliant echo cancellation in software.